In professional sports there are athletes who are prone to injury and then there are the tragic cases, men and women so susceptible to the whims of anatomical disaster that their careers take on the air of instruction, like they’ve been chosen by unseen forces to be the embodiments of the coldest lessons the universe has to teach us: that this is all passing, that we will fall apart, that we will all cease to be. What other explanation could there be for a man like Greg Oden, the former first pick of the NBA draft whose short, much-anticipated career consisted almost entirely of knee surgeries and months spent sitting on benches, watching other men play basketball, before limping to its inevitable end? Why would nature or God or the universe create such a near-perfect physical specimen only to break that specimen apart every chance they had? What did the ancestors of those athletes do for them to deserve such a fate, what witch in the woods did they disrespect, what kind of curse did they bring down upon themselves and their future generations? Today news came down that UFC lightweight contender, and noted bear-wrestler, Khabib Nurmagomedov has been forced out of his Dec. 11 fight with Tony Ferguson with a rib injury. That fight was supposed to be the long-awaited return to the Octagon for a fighter many believe to be the best lightweight in the world but who has been sidelined for nearly two years with repeated knee injuries. Every time it seemed like the Dagestani wrestler was on the verge of making a triumphant return and getting back to the business of scaring the wits out of the rest of the division, his fragile knee would once again buckle from under him, leaving him out in the cold, the undefeated prince unable to inherit his rightful throne, even as fighters he’d beaten badly went on to claim the belt and fighters he’d been scheduled to fight went on to challenge for it. Throughout it all, Nurmogomedov kept his spirits and his wits about him, engaging in social-media wars with the other big names in the lightweight division and making himself a sort of perpetual contender-in-absentia: the man lingering in the shadows, the guy everyone knew deep down in their hearts they would have to fight one day if they truly wanted to be considered a champion—a psychological torment in the form of a Russian wrestler. “I’m not sure if I will ever come back.” How awful is that? 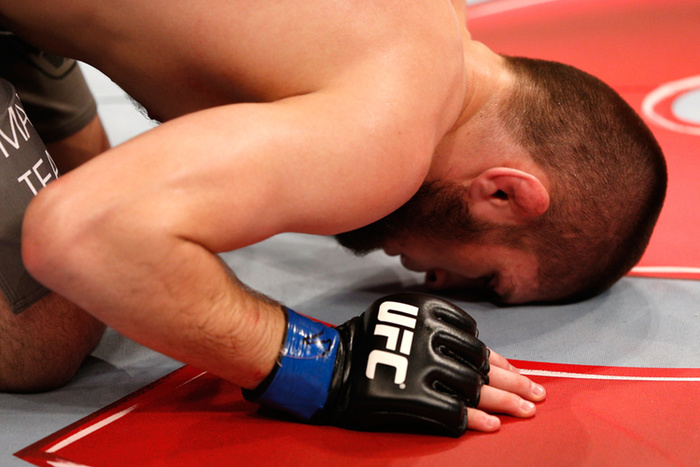 Barely 27 years old and Nurmagomedov is sounding a fatalistic alarm about his career. Not even an alarm, really, just an acknowledgement—resignation to the cruel indifference of nature. What kind of sinister joke is this to play on a man in the prime of his fighting life, a man whose body should be an example but has become a memento mori: a reminder of our own mortality? Oh Fates, did you have to choose such a man to prove your spiteful point, to serve as a lesson to all us weaker mortals—who would never ever fight a bear or step into a cage, who look to men like Khabib Nurmagomedov to be brave in our place, while we sit back, safe and sound—that even the toughest among us are dust and clay that might stop a hole to keep the wind away?